A surgeon from Healing the children meets with a patient and his father. This year Catherine Crowley and her team accompanied Healing the Children surgical mission to Neiva, Columbia. 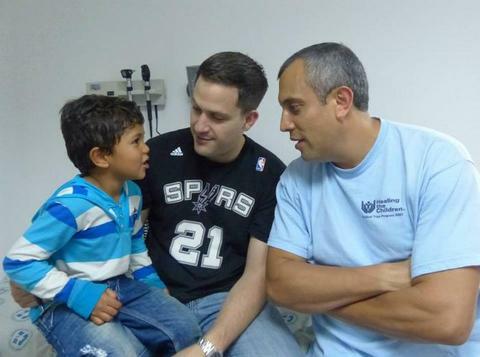 Healing the children is not a typical cleft palate repair mission. Traditionally, a cleft palate team would travel to a developing country and do many dozens of cleft lip and palate repairs and then return to their home country. However, a child with a repaired cleft lip or palate actually requires onoing therapy, monitoring and often further surgery in order for the repair to be successful. Without this type of long-term support, many children do not learn to talk intelligibly, despite the repair and can even develop fistulas (holes) as they grow. 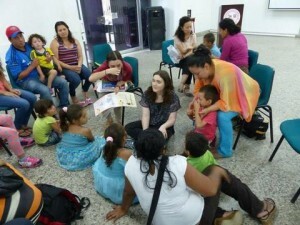 Healing the Children instead conducts annual trips back to Neiva. This was their 21st trip and Cate’s 2nd trip back. They work with the same patients each year while providing therapy and further surgery, including later revisions, bone augmentation and orthodonture. Cate’s team was there for the second year and offered a 5 day training course for fonoaudiologists (speech therapists). The fonoaudiologists learned the specific knowledge and skills they will need to provide quality services to children with repaired cleft palate.Classes were given in the morning and then the clinicians provided services, including language stimulation, in the afternoon to patients. Therapy was provided in group sessions to patients of Healing the Children. The children will be provided with ongoing therapy and monitoring of their progress as well as follow-up surgery if required.